Denise is a graduate of the Massage and Reflexology programs. She also obtained her Mastery in Toe Reading. 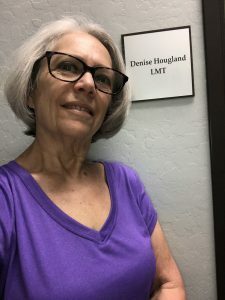 Denise has her office in the Independent Professionals Wellness Center in Mesa near Greenfield and Baseline roads, South of the US 60. Her office hours are Monday through Friday 10:00 am to 6:00 pm and Saturday 9:30 am to 5:00pm, by appointment. For more of her story please visit her website www.soulyinspiredaz.com or at www.independentprofessionalscenter.com under Spa Treatments.